For decades, art lovers in Vienna knew her only as the Lady In Gold, a nameless, raven-haired beauty immortalized through oil. But to Gustav Klimt, creator of this “Mona Lisa Of Austria,” she was Adele Bloch-Bauer, a Jewish socialite whose likeness the artist twice committed to canvas. Woman In Gold, about the real-life battle for a disputed national treasure, argues that hanging Portrait Of Adele Bloch-Bauer I under a generic new name—as The Belvedere did, years after Nazis stole it from Bloch-Bauer’s family—was emblematic of how Austria tried to paper over its involvement in Hitler’s reign of terror. That’s a credible thesis. It’s also pretty rich, coming from a film that performs its own historical makeover. 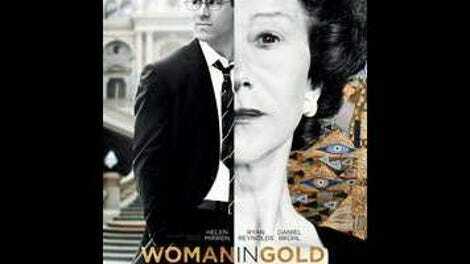 An early contender for the most Weinstein movie of the year, Woman In Gold bends a complicated legal quagmire—heavy on questions of ownership and national responsibility—into a crowd-pleasing David and Goliath story. The title, too generic for Klimt’s masterpiece, suits the movie just fine. Swapping her native British accent for an impeccable Austrian one, Helen Mirren brings a zesty eccentricity to the role of Maria Altmann, grown niece of the lady in gold. In 1998, a half-century after she fled her homeland for the sanctuary of the States, the widowed Maria begins quietly investigating ways to reclaim the pilfered paintings, including the famous rendering of her late aunt. For legal counsel, she looks to Randy Schoenberg (Ryan Reynolds), whose grandfather, the revered Jewish composer Arnold Schoenberg, was a friend of the family. Randy doesn’t know much about art, nor does he have the full support of either his new boss (Charles Dance, doing another stern variation on Tywin Lannister) or his spouse (Katie Holmes, in a housewife role as thankless as the one she played for Tom Cruise). Nevertheless, the attorney’s interest is piqued, especially when he sees the price tag on that iconic artwork.